It seems like during the last days of October through the first days of November, there are many countries throughout Latin America and Europe that celebrate some sort of holiday related to death and/or after-death. In Ecuador, we celebrate Día de los Difuntos, translated as Day of the Deceased, on November 2nd, it is a holiday meant to honor the life of those who have passed away. Día de los Difuntos coincides with the Catholic holiday of All Souls Day – and just as many other holidays is likely the result of merging a traditional indigenous celebration with a Catholic holiday. The tradition for the Day of the Deceased is for families to visit the cemeteries and take flowers and/or food to those who have passed away. 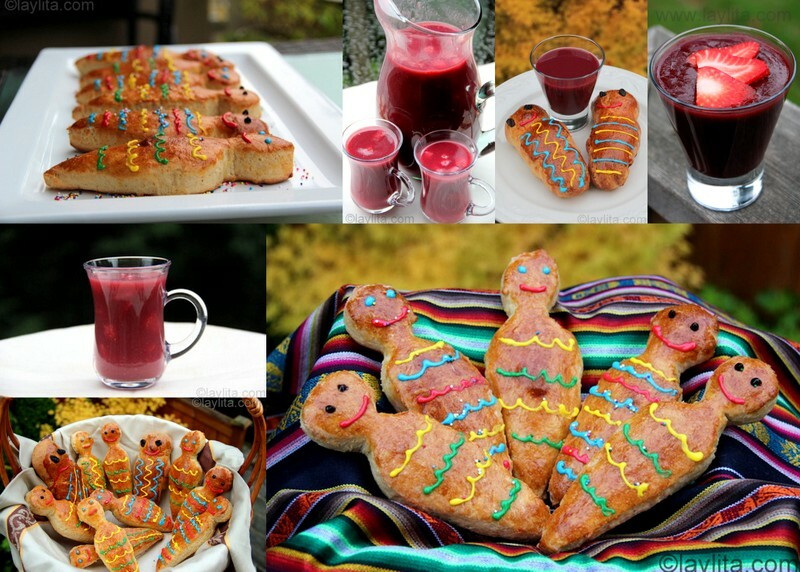 We have a couple of very traditional foods that are prepared especially for the Day of the Deceased: colada morada, a purple corn drink, and guaguas de pan, sweet breads shaped as babies. 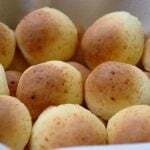 The guaguas de pans are made from a sweet bread dough, which I find very similar to brioche, and are sometimes stuffed with sweet fillings. The word guagua is a quechua word that means baby or child, like many other quechua words it is actually used frequently mixed with Spanish in everyday language in Ecuador, for example, many people say “mis guaguas” when speaking about their children. 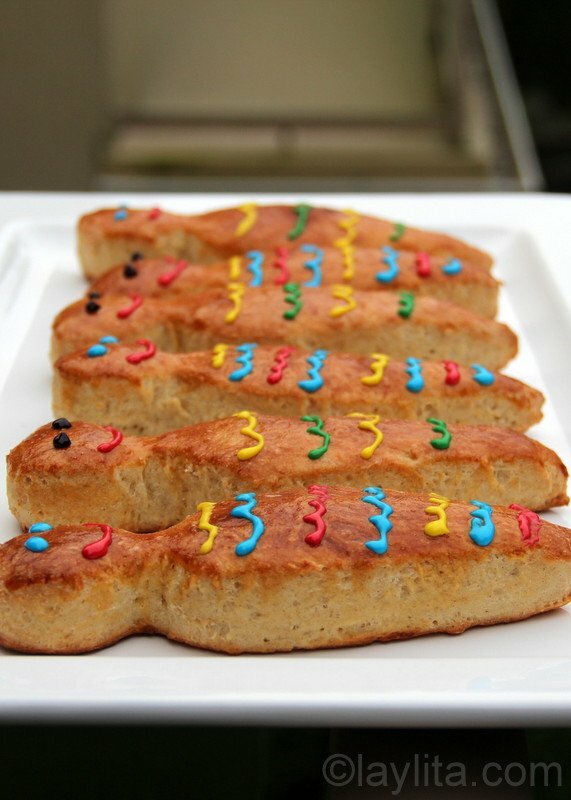 While the guaguas de pan or figuras de pan are the most popular ones, in some parts of the country, especially in the South, they also make breads in shapes of animals, it’s very common to find horses, pigs, birds, and more shapes. 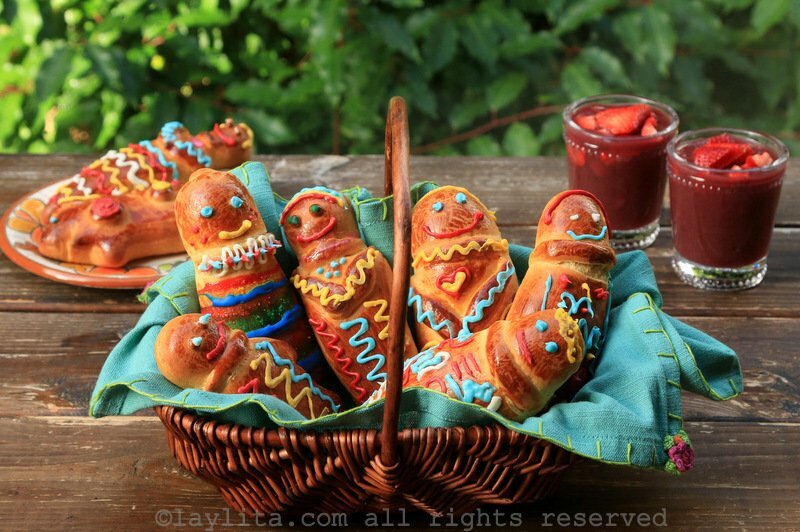 The bread dough used for these is sometimes a little bit sweeter and softer than the traditional guagua bread dough. In Loja, we also refer to the animal figures as puerquitas de pan or little pig breads. Another tradition in some parts of Ecuador is for godparents to give their godchildren a puerquita or guagua de pan during this time of the year. I remember hearing that in the past times, they used to make guaguas from an inedible type of dough, and these were meant to be used as offerings for the graves. This reminded me of my old Ecuadorian history classes where we learned about the ancient traditions of the different indigenous groups in Ecuador, some of them would put small human like figures made from clay in the graves or tombs of the dead, and just like many other ancient cultures in the world, they also buried the dead with food and treasure so that they would be comfortable in the afterlife. These tombs or gravesites are also known as guacas, and are sometimes raided by those looking for gold or treasure. Stealing from a guaca is supposed to bring very bad luck, and I’ve heard countless stories of misfortune that has fallen upon those who have tried to take treasures from guacas – so I recommend staying away from them. 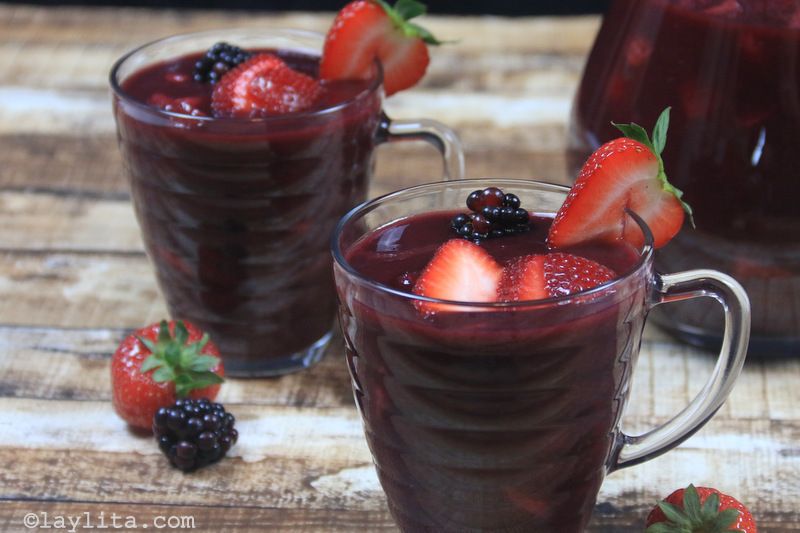 Both colada morada and guaguas de pan can be made at home, the photos right above are links to the recipes for each one, or bought in restaurants or at street stalls that are set up several weeks in advance of the holiday. 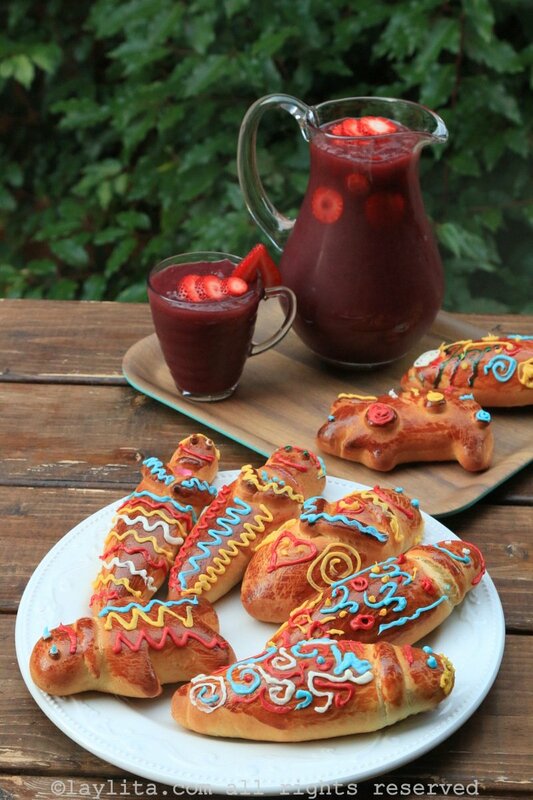 Regardless of the religious aspect of this holiday, it’s an Ecuadorian tradition to go have some colada morada and a bread baby during this time of the year. This tradition is celebrated more in the Sierra or Andean highlands than in Coastal region; it could be likely due to most of the local indigenous population living in this area. 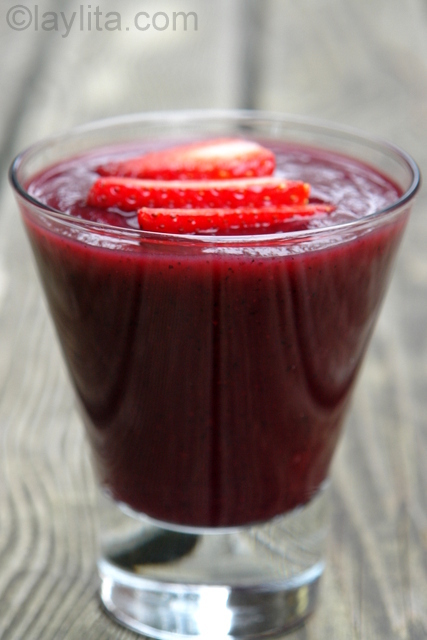 In the Coast, people are more likely to visit the cemetery, but at least when I was growing up, the colada morada and guaguas de pan were not as popular in the Coast. Now there seems to be a stronger awareness of embracing and preserving local traditions, so it is more common to find these food items in the Coastal cities. The celebrations for Día de los Difuntos in Ecuador also varies from one city to another, in the Sierra and also in the Oriente or Amazon region, there are many different indigenous groups and they all have their own customs around the Day of the Deceased. Personally, I also find that this is a good occasion to introduce the concept of death to children; they learn that it is a natural cycle in life; but that we should remember and honor those who are no longer with us by celebrating life. 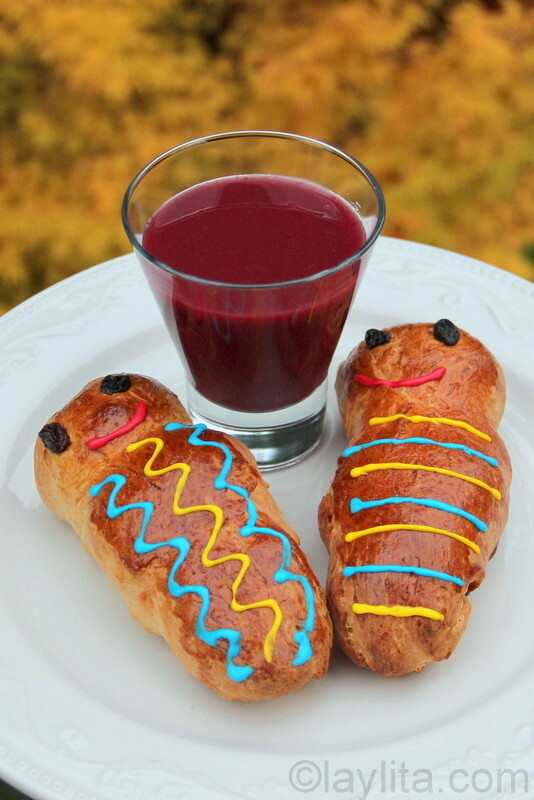 I also like that during this time of the year; my kids aren’t just excited about Halloween, but also about making guaguas de pan and drinking colada morada. I love when I hear them explain to their friends or classmates about how the meaning of the bread babies (and how good they taste). It’s great to see that they enjoy learning about the traditions that I grew up with, and that even far away, we can still incorporate these customs into our lives. Had our first guaguas de pan and colada morada in Parque Calderon, yesterday. Not much of a bread eater, so the guaguas were good, but not my favorite. The colado morada, however, was yummy and I’m planning on another cup today as I wander through the wonderful artisan booths one last time. We spent time in el Cementerio Patrimonial which brought back memories of my childhood in Minnesota. On or before Memorial Day we would make the 50 mile circuit to the various cemeteries where ancestors are buried… cleaning, reminiscing, hearing family stories, and leaving urns of geraniums. Our tradition was a bit more solemn, but very similar. 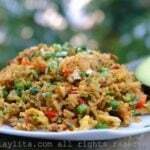 I enjoy your page and many of your recipes. 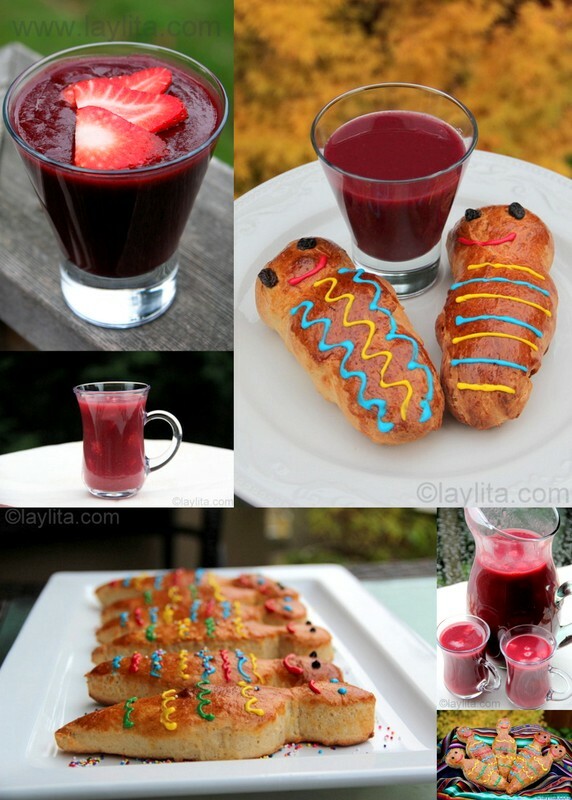 Last year I made Colada Morada and it was a success at my child’s preschool. I love how my child is learning about her culture. I also made guaguas de pan with her. This year I would like to bring again these recipes and a print of your pictures if is it ok with you. Thank you for the inspiration through your blog. Hi Vicky – Thank you for comment! Sure, for school/educational projects it’s fine to use the pictures. Hi Layla, we also commemorate the dead in Romania on the 3rd of November. We also have specific dishes but something we never leave out in this event is the specific “coliva”, which is made of boiled wheat and a good amount of nuts, many essences, that women often do their best to make it better than the others, and “prescuri”, braided bread smeared with honey. I love your blog, and if you want to add a little bit of European cusine I invite you to take a look on my blog, called “Gatim si povestim” (meaning “Cook and Tell”). I’ve only just started out and only have a couple recipes translated to English, but I am working on this.